This was the second game in the narrative campaign my gaming group is doing. You can see the first game over here. 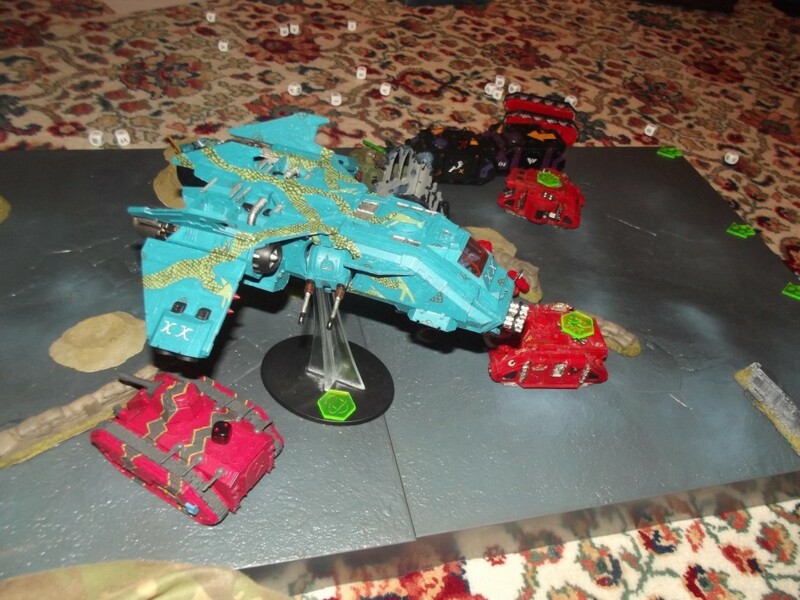 This mission revolved around the alpha legion attacking a supply convoy en route to reinforce the site of a planetside macro cannon, and prepare it for firing at the chaos fleet when they arrive in orbit. 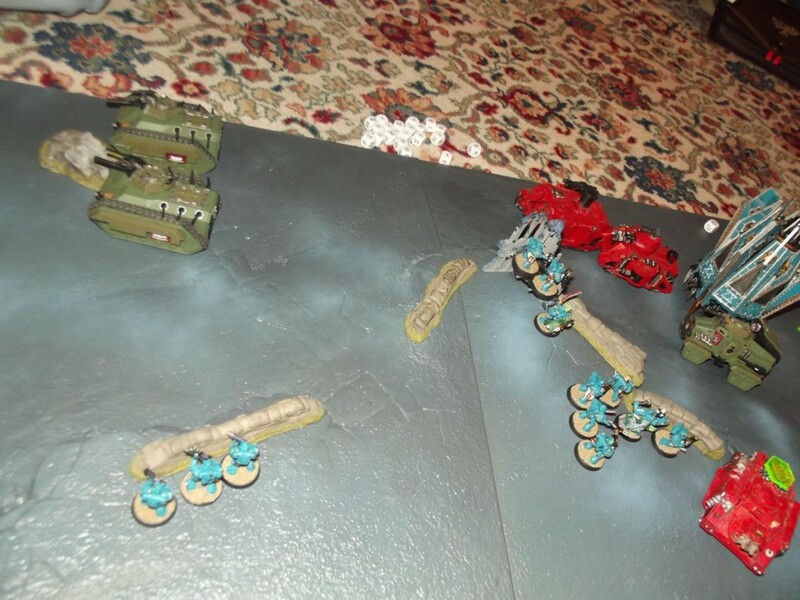 The Alpha legion forces were deployed in secret, and could be revealed from the start of their second turn. The imperial forces add D3” to their first movement when they go flat-out. Fire Raptor Gunship, xiphon interceptor, Contemptor dreadnought with twin linked lascannon and meltagun in dreadclaw drop pod. 5 Man heavy support squad with 5 volkite culverins (Sergeant has art armour and power dagger, unit will snap fire on the turn they are revealed. The alpha legion Fire raptor and dreadclaw containing the contemptor are rolled for from the first reveal of an alpha legion unit. 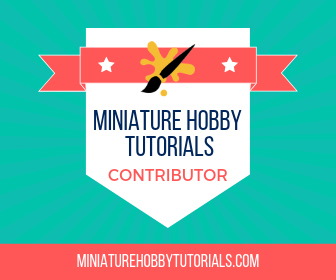 The imperial player can then make a roll for his air support (one 3+ roll needed to bring on both the vendetta and the thunderbolt) once the fire raptor arrives, the Xiphon will then automatically arrive at the start of the next alpha legion turn. The objective for this mission is the transport vehicles. The imperial team gets a point of stockpile for each surviving transport vehicle at the end of the game, or for each that has left the opposite short table edge to where it entered. The alpha legion get a point for chaos if they destroy half of the transports or two points if all transports are destroyed. 54 hours until chaos fleet arrival. Windbreak canyon. 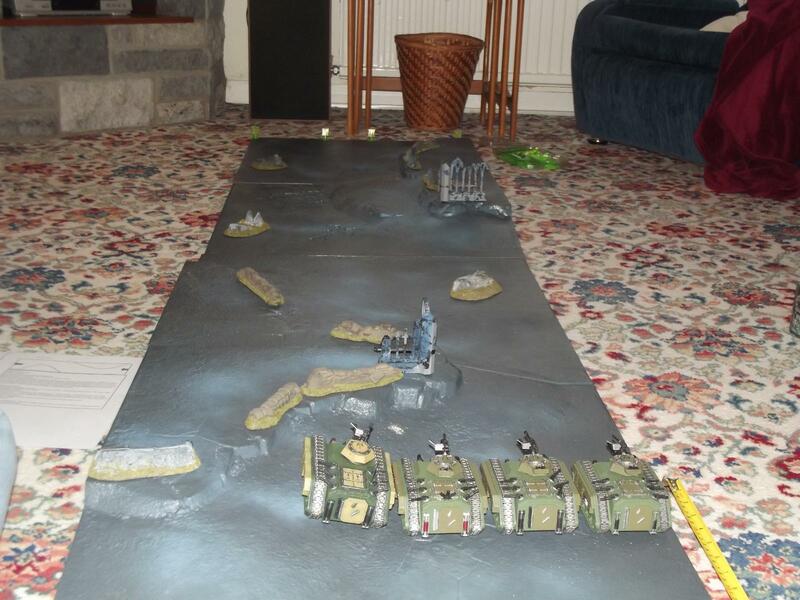 Captain Tyraticus looked down from the open thunderhawk ramp as the convoy moved below. The wind even this far out from the macro cannon site was fierce and buffeted the thunderhawk. As the vehicles started to move forwards into the next area of the canyon two erupted into flames as hidden forces cast off their cloak of secrecy and struck. A falling meteor slammed down engulfing a swathe of the ground below it in fire. He jumped from the gunship with his squad as Squad Sullust moved in from ground level. As he dropped Tyraticus noticed the arrival of a Fire Raptor gunship. It moved swiftly and close to the ground before it opened fire. “Callsign Omega” He yelled into his vox as he struck the ground. The unit he had joined formed around him a moment later and started shooting at the alpha legion foes. The drop pod swept overhead as fire chased it. The thunderbolt and vendetta that had been seconded to the convoy turned it into molten slag as the contemptor dreadnought inside fell groundwards snapping its knees as it landed. 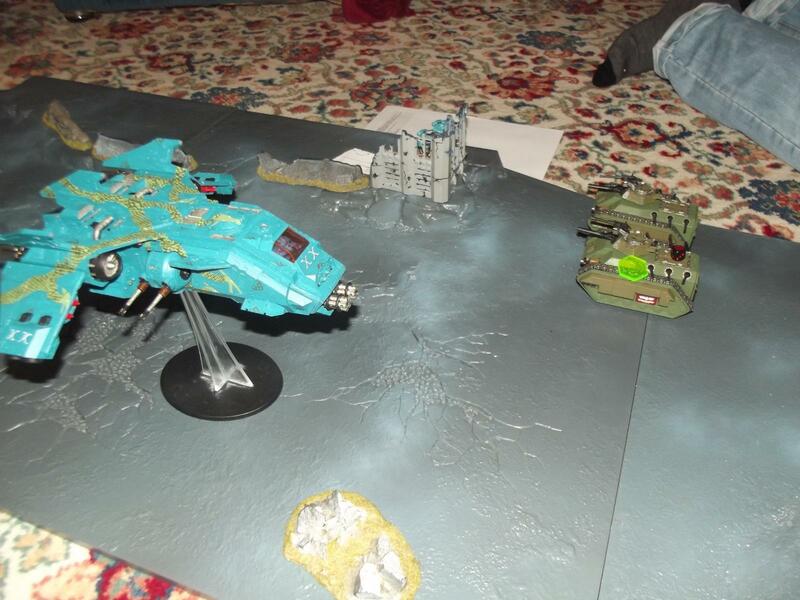 The Alpha legion strike, with the dreadclaw electing to heat blast the vehicles around it on arrival. The Dreadclaw gets surrounded but the jinking vehicle suffers no damage. 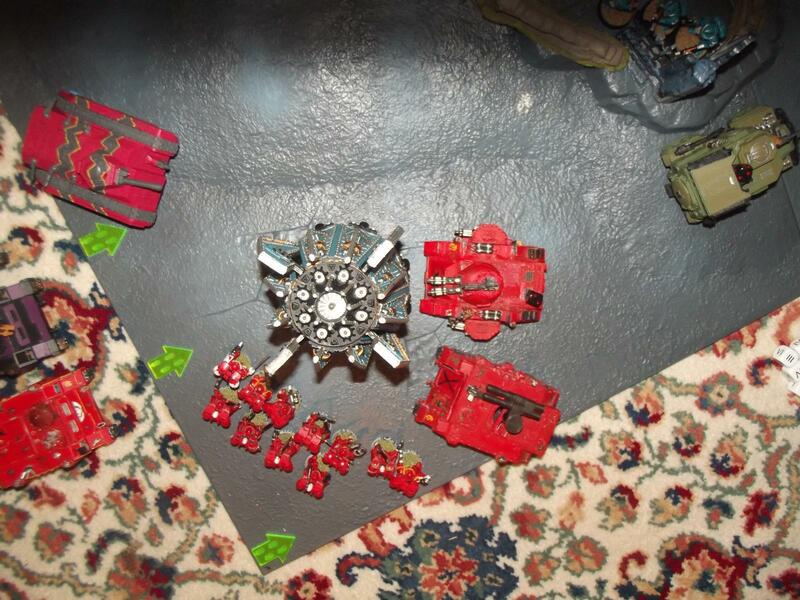 The fire Raptor moves in as the Volkite culverin squad open fire on the chimera transports in front of them. The Imperial air support takes down the dreadclaw immobilising the contemptor as it was thrown from the transport. Squad sullust (Near the wrecked Baal predator) turns primus medicae trask into a puddle of melted flesh with their meltaguns. 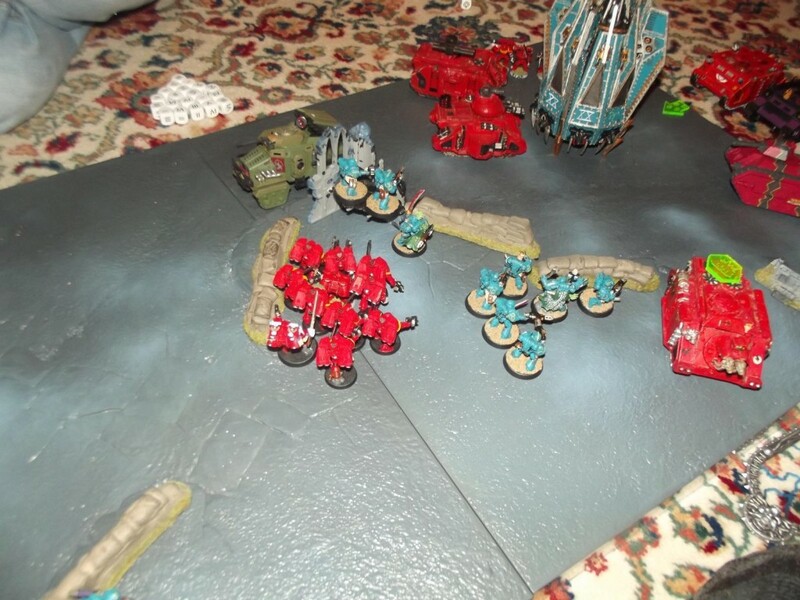 Captain Tyraticus and his assault squad remove the threat of the contemptor after it destroyed the nearby razorback. Tyraticus himself sinking his Lighting claws into the rear armour of the immobilised machine and wrecking it. The Crater below the chimera is what remains of the Xiphon interceptor. It had arrived and done little beyond failing to finish off a chimera with 1 hull point left It then died when the vendetta scythed it from the sky. The last Alpha legion model left was the fire raptor the alpha legion had destroyed 7 transports from the initial complement of 11. The third squad leapt from the thunderhawk gunship as a Xiphon interceptor sped in loosing a couple of ineffective shots into a weakened chimera before counter fire from the vendetta smashed it from the sky sending it crashing downwards before exploding on impact. 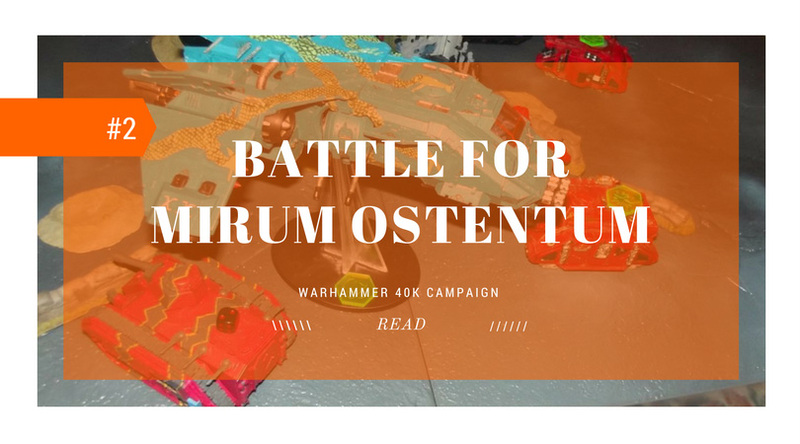 Bolt pistol fire and the shrill sounds of chainblades sounded as autocannon, storm bolter and lascannon fire ceased signalling the end of resistance. The Fire Raptor now lacking targets and ground support peeled off away from the battleground. The two imperial navy fliers struggling to turn against the wind and give chase. Tyraticus looked around as their sanguinary priests gathered up the casualties. 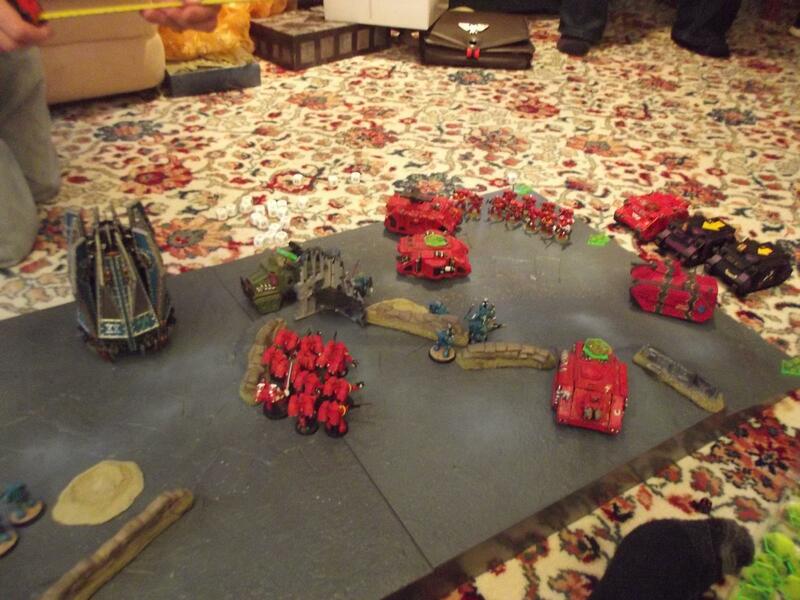 Four blood angels had been lost and only two rhinos and two chimera tanks had survived the ambush. Once the priest had finished his task and recovered the gene seed Tyraticus opened the inter suit vox. 53 hours until chaos fleet arrival – Macro cannon defence location. The lookout flashed his beacon as the convoy approached. The wind noise was severe as the air howled around the site. 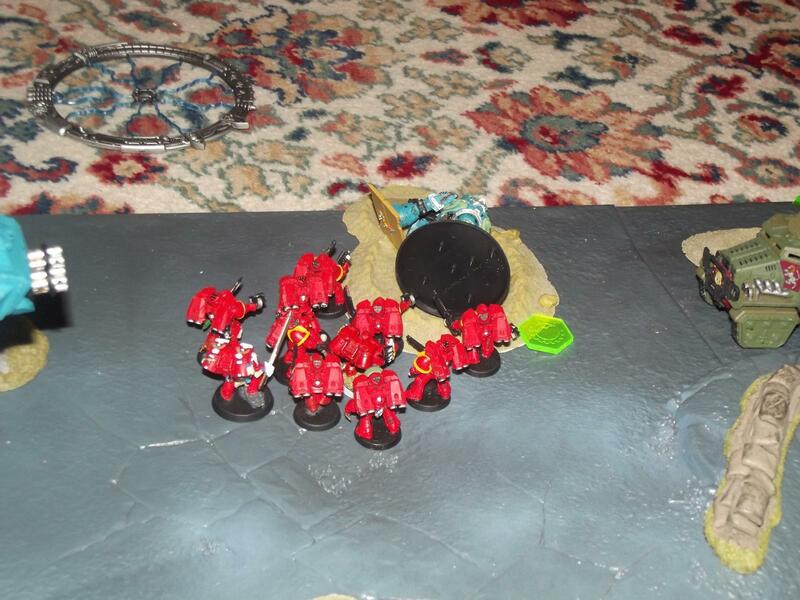 The blood angels had detached their jump packs and where riding the transports via handholds or were walking calmly alongside. The company commander of the defence unit came out of his bunker to greet the arrivals. Tyraticus left his troops to aid in the unloading of the supplies while he stepped into the bunker and out of the screaming winds. With this game we had tested it twice before it was played as part of the campaign. The Alpha legion player managed to destroy one more transport than was managed on the test games. The Xiphon interceptor appears to be cursed as that is pretty much what it did in every other test game. Arrive, fail to damage an enemy vehicle, then get struck by imperial guard fliers and fail two 3+ jink saves before crashing to the ground. 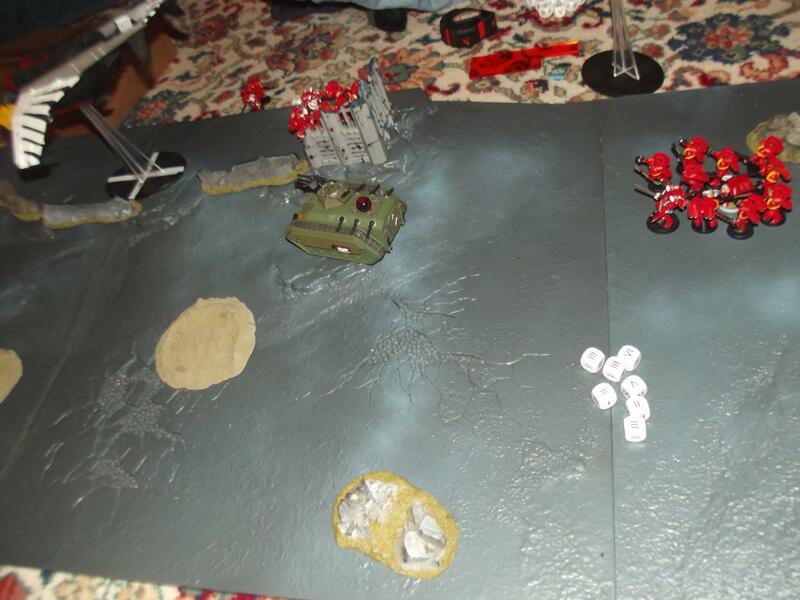 This game granted the chaos forces another point of chaos and the imperial forces gained four points of stockpile. With the campaign as it stands that leaves chaos with 3 points and the imperial forces with 4 points of stockpile. I will cover more of the campaign as it unfolds. Cool report, and I like the mission. 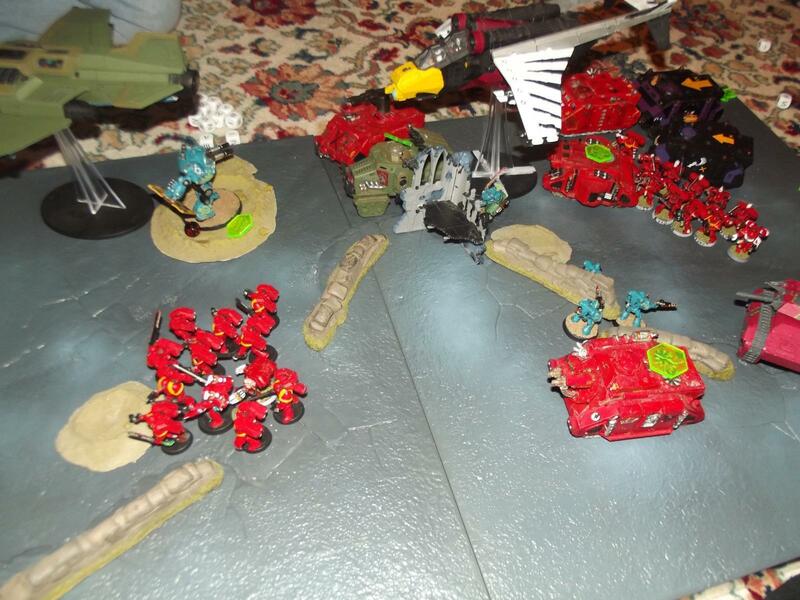 I’ll continue to say that this is how 40K is meant to be played, to tell stories. I’m looking forward to more of these. Thanks Thor I’ll keep up on reporting the outcomes of the campaign as it progresses as well as explaining the missions we have been playing. I love a good campaign, keep it up. Will do. Look forward to more soon. Good stuff, twas fun to read and you listened and added more pictures. Bravo! I think the Alpha Legion could have tried for a couple of tactical squads to flesh out numbers and it would have helped them. Fire Raptors are real beasts though. During testing the alpha legion did manage in one mission though use of terrain and insanely good dice rolls to completely box in and destroy all but one of the transports using the same forces presented above. [Although one rhino died when the xiphon’s exploded remains landed on it.] The average was 6 destroyed transports over the course of the testing.